Production of the sixth season of Netflix series House of Cards has been suspended following sexual assault allegations against actor Kevin Spacey. Spacey, who stars in the political drama, has been accused of making sexual advances to a 14-year-old boy. The show was already due to end after this season, but production is now suspended "until further notice". The Old Vic theatre in London, where Spacey worked for 11 years, said it was "deeply dismayed" by the allegations. The 200-year-old theatre has set up a confidential complaints process for anyone connected to the Old Vic to come forward. The Old Vic said in a statement: "We aim to foster a safe and supportive environment without prejudice, harassment or bullying of any sort, at any level." 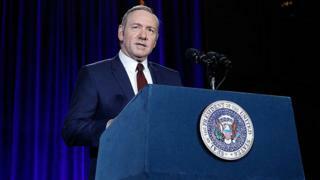 The decision to end House of Cards was announced in a joint statement by Netflix and Media Rights Capital (MRC), a production company that makes the series. "MRC and Netflix have decided to suspend production on House of Cards season six, until further notice, to give us time to review the current situation and to address any concerns of our cast and crew." The announcement comes after Star Trek: Discovery actor Anthony Rapp on Sunday accused Spacey of inappropriately touching him when he was 14 years old. Spacey, who is also executive director of House of Cards, said he owed Rapp, now 46, a "sincere apology" for what he said would have been "deeply inappropriate drunken behaviour". Spacey also announced that he was now living "as a gay man", but the Oscar-winning actor has been widely criticised for choosing this moment to come out. Why are people angry about Kevin Spacey coming out? On Monday, producers said the show would end after its sixth season, which they recently began filming at a studio near Baltimore. A Netflix representative said the decision to end the series in 2018 had been made months ago. According to Variety magazine, producers are considering a spin-off series.